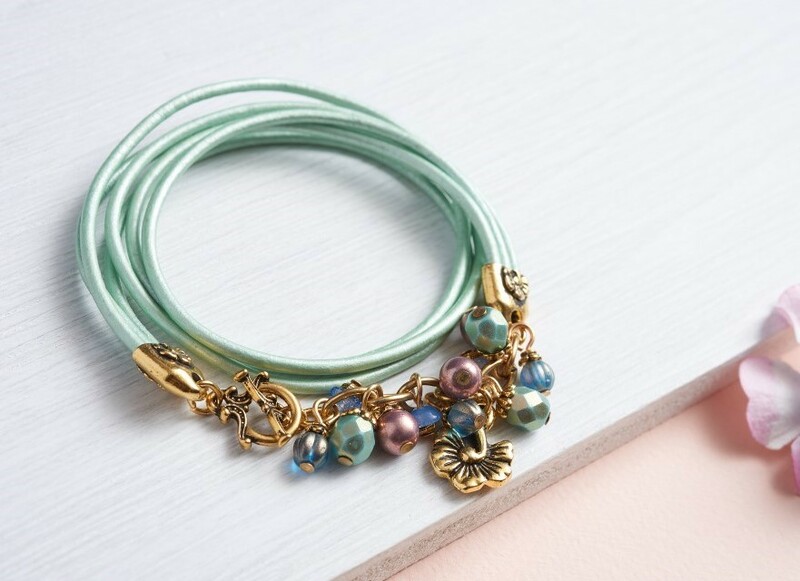 This three strand bracelet wraps around twice for lush, floral adornment! Watch our technique videos on the TierraCast Blog (look for Jump Rings and Simple Loops). Tip: Use adhesive to connect the cords and end caps, or crimp with pliers. Determine size of bracelet desired, (11" cord strands will create an approximately 7" bracelet) then cut 3 equal strands of leather in desired length. If using adhesive, apply into opening of one end cap then insert one end of all three cords. Allow to dry. If crimping, insert one end of all three cords into one end cap, then grasp cap at one side with wide part of chain nose plier jaws and squeeze firmly. Repeat at other side of cap. Check to make sure all three cords are secure and repeat crimping if necessary. Making sure cords are straight and not over-lapped, repeat Step 2 with second end cap at other end of cords. Open one jump ring and attach to loop of one end cap. Before closing jump ring attach loop of clasp ring. Close jump ring. Open one jump ring and attach to loop of other end cap. Before closing attach end link of chain segment. Close jump ring. Open one jump ring and attach to other end of chain. Close jump ring. Open one jump ring and attach to jump ring placed in Step 6. Before closing add clasp bar. Close jump ring. String one faceted spacer onto one head pin, followed by one teacup bead. Form simple loop. Repeat twice. String one melon bead onto one head pin, followed by one 4mm bead cap. Form simple loop. Repeat twice. String one 6mm bead onto one head pin, followed by one 5mm bead cap. Form simple loop. Repeat 5 times. Open one jump ring and attach to link close to center of chain. Before closing jump ring add charm. Close jump ring. Attach bead dangles along chain as desired.